Should You Buy an Airline Stock Which Nearly Doubled In 2016? Can a carrier that handily outperformed the industry in 2016 repeat its success this year? I don't have a fear of flying, or a fear of heights, but I do have a fear of buying stocks that have flown extremely high during the previous 12 months. In 2016, many airline carriers' shares booked quite modest gains, but not Panama-based Copa Holdings, S.A. (NYSE:CPA), which operates subsidiaries Copa Airlines and Copa Columbia, and flies primarily in Latin America and the United States. Copa's stock excelled, rocketing nearly 94% on a total return basis last year. Over a five-year period, the carrier's total return equalled only 77%. 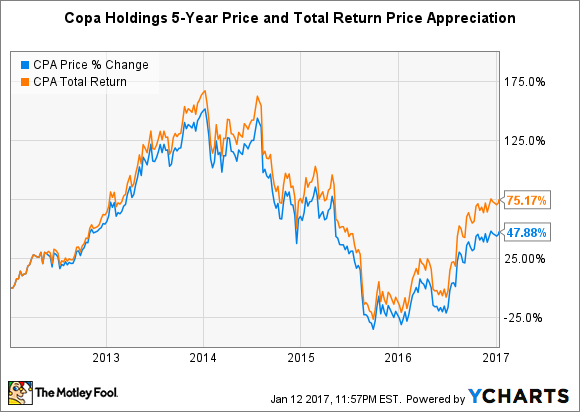 As you can see, Copa is still recovering from a share pummeling it absorbed after peaking in 2014. That year and well into 2015, the company saw pronounced weakness in three of its primary markets -- Brazil, Venezuela, and Columbia. Slowing economic growth in these three countries was accompanied by their respective currencies' deterioration against the U.S. dollar, Copa's reporting currency. The same dynamics played out through nearly all of Copa's secondary Latin American markets. As a result, in 2015, passenger revenue per available seat miles, or PRASM, dropped nearly 21%, to 10.0 cents, and net income swung from a $362 million profit in the prior year to a $225 million loss. To counter these headwinds, management began to reduce its pace of capacity expansion, primarily by deferring aircraft deliveries. Copa flies a mix of Boeing 737 aircraft and Embraer 190 aircraft, and exited 2014 with a total of 98 planes. The organization added just two airplanes in 2015 and is expected to end 2016 with a net reduction of one airplane, to finish the year with 99 aircraft. For 2017, prudence is the operative word: Management forecasts a net addition of only a single aircraft next year. The carrier also expanded its network with restraint over the last two years. Copa added six new destinations in 2015, including David, Panama's third-biggest city, Belize City, the Mexican cities of Puebla and Villahermosa, and New Orleans and San Francisco in the U.S. It was similarly careful in 2016, adding just three new destinations: Rosario, Argentina, Chiclayo, Peru, and Holguin, Cuba. Image source: Copa Holdings SEC 6-K Filing, 12/12/2016. As the year-to-date statistics on the right-hand side of the table show, for the first 11 months in 2016, Copa's available seat miles, a central measure of capacity, grew by just 1.5%. But revenue passenger miles jumped 8.4%, and consequently, Copa's load factor improved more than 5 percentage points year over year. In fact, these favorable trends seemed to be strengthening at year-end. Copa recorded its highest load factor ever in the third quarter of 2016, at 84.2%. This offset yield weakness, enabling the company to record higher unit revenue versus the prior year, for the first time in two years. In order to continue its stock-price recovery, Copa will have to originate strategies optimizing performance in major Latin American markets, which may have a long recovery period ahead of them. To this point, in December, Copa launched "Wingo," based in Bogota, the company's first foray into the low-cost carrier (LCC) business. It's actually a rebranding of the existing Copa operation in Columbia, and according to CEO Pedro Heilbron, a way to try to turn around the losses in that country. More generally, the carrier will need to continue to expand its operating margin, which suffered during its 2014 to 2015 downturn. Through the first nine months of 2016, operating margin increased to 13.5% versus the prior year's unsightly performance of 9.2%. The company is forecasting a 2017 operating margin of between 15%-17%. This should bring Copa's profits back in line with its peers, not to mention its own historical margin levels. As for risks, the potential for fuel increases in the next one to two years may present a challenge for Copa Holdings (and the industry as a whole). But in the near term, the company will actually see some relief on its profit and loss statement as a number of long-term fuel hedge positions roll off the books. According to management, the company's hedging strategy has produced a negative $200 million impact to earnings over the last two years. During 2017, fuel volume covered by hedging will drop from a recent average of 35% to 6%, which should decrease realized losses in this activity. It's an understandable quirk of psychology that it's hard to buy a promising stock that has skyrocketed in a given year. Yet even though final results for 2016 aren't in yet, Copa clearly returned to profitability last year. And with a forward price-to-earnings ratio of roughly 13.5, in line with aviation peers, the near-doubling of "CPA" last year hasn't made the stock expensive on a relative basis. A bit of rational fear is always healthy, but this aviation stock has room to climb further in 2017.